Cotton growers are an integral part of their communities, as proved by North Carolina cotton grower David Burns. 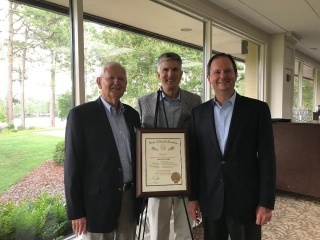 On June 16, 2018, David Burns was presented with the Longleaf Pine Award. Bestowed by The Order of the Long Leaf Pine Society, it is one of the most prestigious awards conferred by the Governor of North Carolina. It is awarded to persons for exemplary service to the State of North Carolina and their communities that is above and beyond the call of duty, and which has made a significant impact and strengthened North Carolina. Burns certainly meets the criteria through his dedicated years of service to his local and state communities, as well as to the larger community of U.S. cotton growers. Among his many local accomplishments are: his work on behalf of Scotland County as Chair of the County Commissioners; Chair of the Scotland Memorial Hospital Board; Chair of the St. Andrew's College Board; and service to Richmond Community College on the Foundation Board. Additionally, Burns has served the southeastern region of North Carolina through his role as Chair of Cape Fear Council of the Boy Scouts of America as well as his work with North Carolina’s Southeast Regional Economic Development Partnership. He served the entire state of North Carolina through his work on the Department of Transportation Board (Gov. Perdue appointee), and the Agriculture and Forestry Awareness Study Commission (Gov. Cooper appointee). Burns has also provided leadership to the U.S. cotton industry as President of the Southern Cotton Growers Association, as President of Cotton Council International, and as a Director on Cotton Incorporated’s Board. During his tenure as the Cotton Board’s Chairman, Burns fostered an easy assimilation of importers onto the Board, while maintaining a focus on the common goals of the dual constituency. For these efforts and his ongoing leadership, Burns was inducted into the Cotton Research & Promotion Hall of Fame in 2015. The Order of the Long Leaf Pine was presented to Burns at a ceremony in Southern Pines, NC. On behalf of North Carolina Governor Roy Cooper, the award was presented by Gene McLaurin, former North Carolina Senator from District 25 and former Mayor of Rockingham, NC, who also nominated Burns for the award.